It grew along with the pet food category. Consumers spent $18.58 billion on pet supplies in 2017, according to the Pet Business Professor blog. That represented an increase of $2.74 billion, or 17.3 percent, versus 2016. In many cases, dollars saved in one of the two categories are spent in the other. Interestingly, prices in both categories deflated, Gibbons wrote. “Value was the ‘word’ and it was available across the market,” he explained. Lance Reyniers launched the Python Products brand in 1984. Lance A. Reyniers, founder of Python Products in Milwaukee, has died. He was 70. Reyniers passed away peacefully at home with his family by his side, according to his obituary. Python Products offers products for aquariums and ponds. Reyniers launched the Python Products brand in 1984. Reyniers also served on the board of directors of World Wide Pet Suppliers based in Monrovia, CA. He chaired the Trade Show Committee. Reyniers was a disabled Vietnam Era veteran, having served in the U.S. Army. The deal gives nearly 70 million households access to Petco delivery. 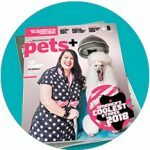 BIRMINGHAM, AL — Shipt, an online grocery marketplace, announced that it is launching same-day delivery of food, grooming and health products and supplies for pets from nearly 1,300 Petco stores across the country. The service was set to begin April 18. The partnership gives nearly 70 million households access to Petco delivery in as soon as one hour across more than 200 total markets. Shipt’s marketplace gives members the ability to browse, search and shop the in-store assortment of products online. Members can note preferences, choose a one-hour delivery window and pay for their order, all within the app. Shipt’s expert team of shoppers takes care of selecting, bagging and delivering the items. The annual membership, which costs $99, grants access to free, unlimited delivery on orders of more than $35. Shipt members can determine if delivery is available in their area by visiting shipt.com/petco. RetailWire notes that Petco also has a same-day delivery arrangement with Instacart.